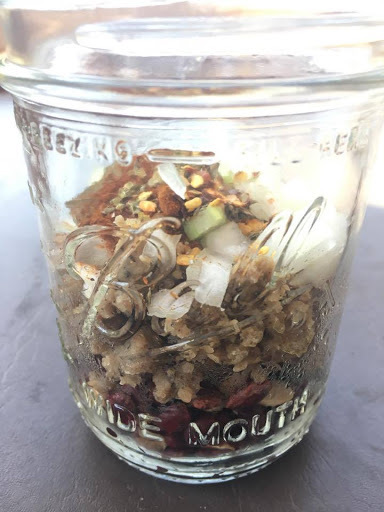 My latest kitchen excursion has been to can meals in jars. Several of my friends have been doing this for a long time. I have canned vegetable soup and chicken soup in the past, but have decided to venture out and try new things. This recipe will be great on a cool fall night. 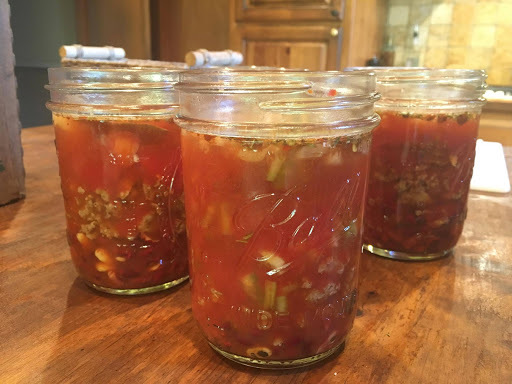 IF YOU ARE NEW TO PRESSURE CANNING, PLEASE RESEARCH CAREFULLY HOW TO STERILIZE YOUR JARS AND USE YOUR PRESSURE CANNER BEFORE TRYING THIS. * You could use any type sliced hard sausage, but we had fresh pork sausage available and I used that. 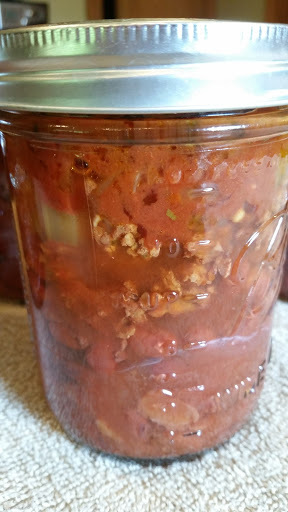 Add the tomato paste to a quart sized jar and fill with water. Whisk to blend well, then shake vigorously. Set aside. Prepare 6 pint sized canning jars. Add 1/3 cup red beans to each jar. Divide the sausage, onions, celery, and bay leaves evenly between the jars. This was my jars before adding the liquids. Pour the tomato sauce equally among the jars (approximately 2/3 cups). If needed, add water to bring each jar to leave a one inch headspace. Wipe the tops well with a damp cloth. Place the 2 piece lids on each jar. After adding the tomato sauce and additional water. Process in a pressure canner at 11 pounds of pressure for 75 minutes. ALWAYS FOLLOW THE MANUFACTURER’S INSTRUCTIONS FOR HOW TO PROPERLY USE YOUR PRESSURE CANNER! I can hardly wait to try these! I’m thinking red beans and rice, as a topping for baked potatoes, a twist on a chili dog? No matter how you end up using them, it will make for a quick and delicious meal when you are pressed for time.